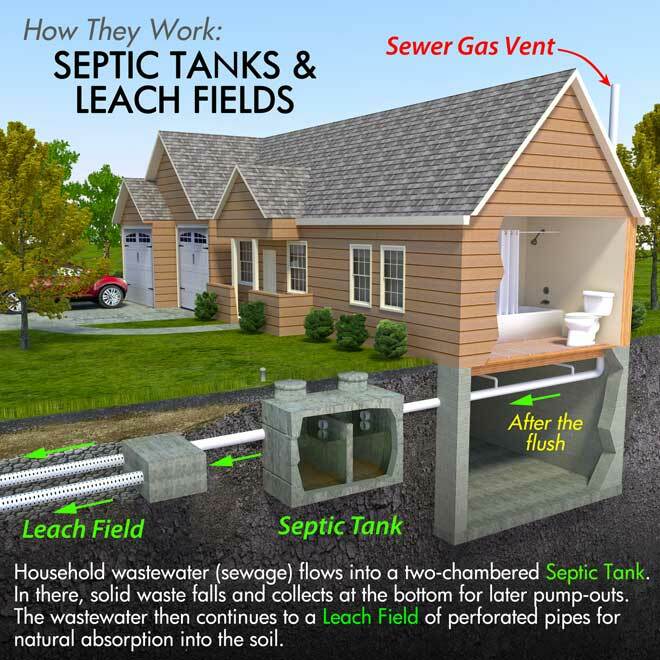 While urban homes tend to connect to a municipal sewer system, many country and older rural homes make use of a self-contained septic system for waste management. Unlike sewer systems, a septic system requires regular maintenance due to the way it handles your waste. This is costly when working through a waste management company, but you may potentially save money by maintaining the septic system yourself. Septic systems consist of two major components: a well or septic tank and a drain field. Updated systems use a septic tank instead of a well for improved efficiency, although some older homes still use wells. While essentially the same concept, there are some minor design differences which may lead to different issues. This large underground tank is directly connected to your home’s main sewage line. When you flush your toilet or run your sink, the waste water flows into the tank where it is digested by anaerobic bacteria. The process separates the waste into three parts. Solid waste sinks to the bottom, and lighter particles form scum on the surface. As more sewage is flushed into the tank, the older water is pushed into drainpipes where it seeps harmlessly into the surrounding field. In older well-based septic systems, there is a large masonry-lined well covered by a stone or concrete lid into which the waste water flows instead of a tank. Once in the well, the anaerobic bacteria begins feeding on the sewage. Solid waste sinks and scum forms along the surface. Unlike tanks, which have pipes leading to a drain field, the well walls have small openings through which the water seeps out into the surrounding ground. As the process is not as efficient as with septic tanks, cesspool wells are now illegal in some states. As a general rule, septic systems require little maintenance over the course of a single year and are therefore easily forgotten. This leads to issues which may potentially lead to sewage flooding your yard or backing up into the home. Clogs and a full septic tank are the two most common problems you will encounter. Cesspool wells rely upon bacteria to separate the solid and liquid wastes, but this process is not perfect. Over time, the openings in your cesspool may become clogged, causing a wastewater backup. If not kept clean, the cesspool may begin to require pumping several times per year. This may even occur if there is not a large amount of solid waste in the bottom due to the inability of water to escape. If not pumped every three to five years, your septic tank may become so full of solid waste that it overflows. The least damaging sign is a persistent foul odor near the tank or in your bathroom. This rotting smell may be more noticeable in hot weather. Another common symptom is a slow-draining or frequently clogged toilet. Plunging and drain cleaners will prove ineffective if the problem is related to the septic tank and not a simple drain clog. Continued use of the toilet without cleaning the septic tank may lead to overflows and sewage damage to your home. The third sign of a full septic tank is moist ground above the tank’s location. In extreme cases, the flooding may even include visible sewage or toilet paper. Any plants in the flooded area may become sick or die off, leaving bald patches in lawns or other aesthetic damage. There are three basic ways to clean out your septic system, each with their own advantages and drawbacks. Be sure to check your local and state laws before attempting to empty the cesspool by yourself. A chemical alternative for cleaning out the cesspool, aeration involves pouring sulfuric acid into the well or tank. The acid breaks down the solid waste and sludge, allowing air to pass through. As a result, the waste is dissolved without extensive pumping. The downside to this method is that sulfuric acid is corrosive and may cause damage to your septic system if not used properly. Another alternative method used in wells which may reduce or eliminate the need for pumping is to use hydro-jetting. A high-pressure blast forces water into the ground at the bottom of the cesspool, breaking up the solids. This method has the fastest recovery time when cleaning a well. The most common method of cleaning out a cesspool is the use of a large pumping truck. This vehicle empties out your cesspool into a large storage tank. According to CostHelper, the price for pumping generally runs between $75 and $200, but larger tanks may cost $300 or more. This estimate doesn’t include additional costs, such as excavating and refilling the ground above the tank. You may choose to excavate the manhole cover yourself or rent a backhoe for larger operations. Pumping is considered the default method for cleaning out septic tanks and should be performed every two to four years. Some smaller tanks may require annual pumping if used heavily, while even large and seldom used tanks should be pumped at least once every five years. Note that in many states, it is illegal to pump a cesspool without proper certification. Although wells and tanks are slightly different, the same steps may be taken to reduce the frequency of pumping and maintain the overall health of your system. Household chemicals, especially ammonia or antibacterial cleansers will kill the bacteria and prevent the sewage from being broken down. Diapers, paper towels, and other hygiene and paper products are not designed to be flushed and may create blockages. As they aren’t designed to break down as quickly as toilet paper, these products might sit in the septic system until the next schedule pumping. Grease solidifies as it cools and has adhesive qualities. Not only will hair and other debris stick to it, the grease will also line pipe walls, building up until it creates a blockage. Avoid putting bone or vegetable matter in your garbage disposal. Doing so may release grease, fat, or other insoluble liquids into the septic system. Powdered laundry detergents incorporate an insoluble clay which may cause clogging. Therefore, use only liquid detergents when possible. It is also important not to use too much water at once. Aim downspouts away from the septic system and avoid running multiple water-intensive appliances at once. Regardless of whether you have a well or septic tank, the waste takes time to break down and large volumes of incoming water in a short amount of time may overwhelm the limited capacity of your system. Septic systems are designed to separate and store waste. As a result, they need to be cleaned out occasionally to prevent overflows or clogging. A simple test may be performed using a stick long enough to touch the bottom of your well or tank. When dipped and examined, the sludge level should be one-third or less of the tank’s height. If the stick shows a higher level, you will need to pump. As septic tanks include drain fields, maintenance requires additional steps. For example, the front and rear baffles on a septic tank must be kept clear of sludge to prevent a potential rupture. Common signs of damaged baffles include unusually lush vegetation or foul odors coming from the drain field. One less common variation of a cesspool is an above-ground cesspool lagoon. This form of septic system appears primarily in areas where the soil cannot support a drain field and municipal sewer systems aren’t available. Waste water is pumped into a shallow lagoon where sunlight and oxygen decompose the waste quickly. There are a few special steps which must be followed when caring for a cesspool lagoon. Erosion of the ground surrounding a lagoon is a major concern. For this reason, you should install short, hardy plants along the perimeter of the lagoon to help reduce erosion without blocking the flow of air along the surface. Trees and shrubs which lose their leaves in the autumn may also cover the lagoon and prevent proper aeration, so avoid planting them near your lagoon. It may become necessary to dredge the lagoon using a backhoe if the level approaches the top embankment. In addition, shrubs growing in the lagoon clog the system and hinder the aeration process. Therefore, it’s important to remove any saplings which appear in the lagoon while they’re small, or you will eventually have to use a backhoe to protect your system. Due to the exposed nature of cesspool lagoons, it is important to add fencing to prevent children or animals from falling in. Make the enclosure large enough to permit mowing. You will also need to annually treat your lagoon with dunks, which are available at your local county extension agency. These small disks help prevent the breeding of mosquitoes. The Environmental Protection Agency website contains an extensive guide to septic systems, including information on systems and government programs which help finance your system. The El Dorado County, California website includes a detailed explanation of septic tanks, including a chart on how often you should expect to pump your tank based upon household and tank sizes.